Emerald is the green variety of the mineral beryl, owing its vibrant color to a trace amount of chromium and occasionally a slight trace of vanadium. The majority of emeralds contain several inclusions of softer minerals. These inclusions have been termed "jardins", meaning gardens in French. Occasionally, these inclusions make it difficult to set the emeralds without damaging the gem. Emeralds have been cherished since man first discovered them and they are one of the most valuable of all gems. 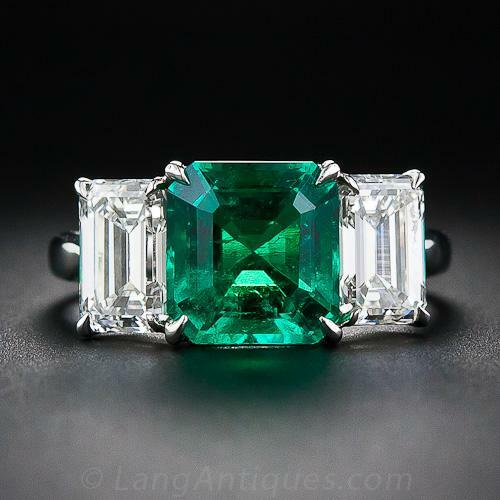 At times, emeralds have been more desirable than diamonds, rubies or sapphires. Emeralds were discovered in southeastern Egypt more than 3000 years ago. The Egyptians, Greeks and Romans worked these vast emerald mines for centuries. These mines have long been inactive. Today, some of the finest emeralds in the world are mined in Colombia. Other sources include Russia, Brazil, Zimbabwe, Tanzania and Zambia. Pliny, the Roman Scholar, was one of the first to write about emeralds, praising its vibrant green color as representing the coming of a beautiful and hopeful spring. Pliny described a sculpted marble lion, in the tomb of King Hermias on Cyprus, overlooking the sea. The lion's eyes were fashioned out of natural emeralds that were so bright they scared away all the fish. The fisherman replaced the eyes with common stones and the fish returned. In medieval times, emerald was used as a cure for eye disease and a guard against the evil eye and epilepsy. Emperor Nero, treated his failing eyesight by watching gladiator combats through an emerald crystal. The emerald is the birthstone for May, and one of the gemstones for Cancer, the House of the Crab. It also commemorates the 20th and 35th Anniversary. Crystal mystics continue to ascribe emerald with the ability to aid in curing problems with eyesight. In addition, it is considered to fortify the heart and detoxifies the blood. It is a talisman for all members of the healing professions: Doctors, Nurses, Ambulance, Counselors, Psychiatrists, etc. Emerald is a stone of prosperity and riches, not just materially, but also spiritually. It is a stone of intelligence and communication, intuition, clairvoyance, sensuality, love, romance, beauty, harmony and tranquility. Emerald is a stone of the heart chakra.